We’re in the midst of a challenging time. It’s the kind of time, I’ve realized, that can make the whole prospect of working on home feel irrelevant. When we’re grappling with hard things, matters of decor just don’t matter much. We dismantled our gallery wall early last summer and stuck these on the mantel temporarily to store them. They stayed like this for a good 3 months. Because (thankfully!) the answer to most of those questions is “yes,” we don’t have any kind of big progress to report on the home renovation front. The master bedroom “project” that we began in January has been stalled since early spring. We’re still living with a couple of junky nightstands, a white-washed particleboard floor, and an ugly Ikea bed frame. Doesn’t matter. Everything in the room works well enough and is comfortable enough. We started repainting our living room over the summer. We’re using the one-wall-at-a-time approach we employed the last time we did this. This weekend I was sitting on the couch and noted to Cane, “From right here, I can see walls that are 3 different colors.” (Not to mention, windows with two different window trim treatments.) Doesn’t matter. The walls are holding up the ceiling just fine. This used to be our gallery wall. We found the large painting you can see a bit of at an estate sale last summer. Our entry stairs are still a work in progress–2.5 years after Cane began tearing up the carpet. We don’t like the reclaimed wood thing we did with the top half of them. We can’t figure out what we want to do with the stairs. And until we do, we aren’t feeling like tacking the door, the looks of which we don’t like at all. Doesn’t matter. We have no problem getting up and down the stairs or in and out the door. When we are in a better time, these kinds of projects bring joy. It’s fun to ponder possibilities and tackle new challenges. We’ve got a bank of good feeling and energy we can draw upon to bounce back from the inevitable missteps and mishaps that come with any DIY undertaking. Didn’t see this one coming before we took the vanity out! But that’s not where we are right now. We don’t particularly like that–who would?–but we know that’s how life is. We have times when the living is easier, and times when it is not. We’re in the thick of the latter right now, which means that how we’re doing home isn’t quite the same as it was this time last year.That’s why we’re not going for the home renovation gold right now. We’re chasing small wins. For weeks a light has been burnt out in our downstairs hallway. Two weeks ago, I finally bought a replacement bulb. This past weekend, Cane put it in. You know how sometimes you can’t feel how uncomfortable a pair of shoes is until you slip them off at the end of the day? And then you do, and you can’t believe how sweetly relieved your feet feel? That’s how I felt when I pushed on that light switch (which I’ve continued to do, from habit, all the weeks it was burned out) and it turned on again. Who knew something so small could feel so good? Cane didn’t stop there. He also unclogged our bathroom sink. It wasn’t unusable the way it was. It was just draining really, really, r-e-a-l-l-y slowly. But it was annoying and gross and draining more slowly every day. Both of us had periodically pulled out the hair gunking it up near the surface of the drain, but we really needed to get into the pipes and clear them out. Cane did that while I was out with a friend on Saturday, and I can’t tell you what a lift it gave my spirits when I came home and saw that the drain was clear. When I ran water and it didn’t back up at all, I felt that whole shoe thing again. Both of which inspired me to finally do something about a chair we’ve been using in the kitchen. This is a thrift store chair I bought years ago and meant to do something really awesome with. (You know, my chair addiction.) I was sure I’d paint the frame and do something great with the seat, but I haven’t. I noticed last week, though, that the fabric is actually tearing. Which made me feel crappy, because it felt like a metaphor for things in general. Thinking about the light bulb and drain, though, I realized I don’t have to do a big project to make this better. This chair, it doesn’t need some dramatic before and after involving spray paint and new fabric. Not right now, anyway. So, inspired by my (still on-going) grocery bag sewing project and my blogging friend Katherine’s use-what-you’ve-got approach to projects, I decided to find some fabric I already own and just fix the dang cover. Half an hour on Sunday morning and the job was done. All I had to do was unscrew the seat from the frame, try not to get too grossed out at the evidence that some kind of critter once lived under said seat, staple some new fabric over it, and screw the seat back on. Or was it yet to be hatched…? Do I love this fabric? No. But it’s better than ripped fabric. Are we still struggling with our challenge? Yes. Are we now on fire to tackle those bigger projects we’re stalled on? No. But it’s all good. In the midst of a big hard time, it’s good to have some small wins. It’s good to be reminded that little fixes can make a big difference in how we feel. It’s good to feel competent. It’s good to remember that no time is all good or all bad, and that the important thing is to keep moving forward, doing what we can. Sometimes that’s the only way we can do home, and life. A different kind of small win? Getting out on an early fall afternoon this weekend to appreciate the sun on our faces and the beautiful part of the world we live in. We hope you’ve had a good week/end and we’d love to hear all about your recent wins, big or small. I’m so glad to read about someone else moving slowly (and deliberately) when it comes to the home. It is so easy to set an unreasonable standard for ourselves based on people who do this for a living. Some of us have day jobs and aren’t willing to give up a healthy balance in order to finish the project. The little jobs add up! I have to break up the big jobs into little jobs or I would never get anything done. I’ve gone so far as to work a room on a grid so that I get one section done at a time. Afterall, I may not have enough time in the evenings after work to do it all but I have enough time to do that corner and at the end of the week, I’ve accomplished something. Thinking of you, Cane, and your family as you move through this difficult time. When I was caring for my Mom ( who was both elderly and battling ovarian cancer) all that mattered was showing love to those I care about, getting reasonably healthy food in the table, and making sure my husband and son had some semblance of normalcy to their days. Cosmetic house annoyances didn’t even register with me. Our mantra after living in a 70’s fixer upper house for 6 years is, “This is “good enough”.” Our house isn’t finished, nor are the finished sections decorated perfectly, but it is “good enough” to live in. Would I prefer soapstone countertops in the kitchen? Yes, but at $200 my plywoood countertops edged in black walnut are “good enough”. And you know what, everyone thinks they’re beautiful. I don’t have a gorgeous 4-stall barn for our horses but our 2-stall shedrow barn that we built ourselves is “good enough”. And we didn’t take a loan out to pay for it either since we slowly added onto it over the years. Our master bath still doesn’t have the bath tub in it, but the shower works great. That’s “good enough” for me. I want to live my life and as much as it soothes my heart to be surrounded by a beautiful, finished house, by adopting the “good enough” attitude I have been able to do just that. House projects are now a part of our lives, not the focus of our lives. I admire your ability to see the need for balance and to relish the small accomplishments on a daily basis. Your second wind will come at some point and take you by surprise. Then a home project will seem like a joy again instead of a “have to”. I love the honesty of your blog. I’m so sorry you are going through a challenging time. Best wishes for better times ahead. Glad to hear from you again. A season of Small Wins is just as important (and sometimes, maybe moreso) than one of Big Projects. Hugs to both of you. I just can’t worry about other things right now, although I’d love it if Husband cleaned out my bathroom sink drain. It’s awful and has been on his list for 6 months. He’ll get to it probably after he fixes the lawn mower I broke this weekend…which will hopefully be sometime before the weeds are waist high. Whatever. Spending time together is the priority. I’m sorry for the struggles you all are facing but I hope they have a happy outcome. I have definitely had phases — far more commonly than I would like to admit — where changing a lightbulb seemed like a huge homemaking achievement. I totally understand where you’re coming from. I think that one of the reasons that domesticity — by which I mean both day-to-day homemaking and also the decorating stuff — is important is that it gives us a secure base to support our work in the wider world. It’s easy to dismiss decorating as fluff, especially when issues arise that make What Is Really Important hit home. But you and Cane are reaping the benefits now of all the work you did on your house during an easier time, and that’s no small thing. Nice work on the chair, too! To continue our conversation about the pros and cons of Pinterest, I will say that I think one downside of the site is that it seems to have convinced all of us that we need to spraypaint everything! But what if we just…don’t? I think your chair is quite nice as it is. This is such a great post and perfectly timed. We moved into this house two years ago and have a lot of projects on our list. Many of them not in the budget (time or financial) right now. I find it so easy to get discouraged but there are so many little victories (the pantry freshly lined and organized, my grandmother’s china finally displayed in our dining room) to celebrate. I needed the reminder. Thank you. And I love what you did with that chair. Kate recently posted..Well, that was fun. A small win for me last week was calling someone to come clean our house this coming Friday. My back hurt all last week and the thought of cleaning bathrooms made me weepy. (Pregnancy hormones, but whatever. Still weepy.) I am so very thankful that I get to support a woman who is looking for extra income right now and enjoy a clean(er) home for myself. Win/win. I’m sorry to hear you’re having a hard time. Sending good thoughts your way, and hoping things smooth out soon. I think we often underestimate the power the little things have on us: the power they have to niggle at us and bring us down when they’re left undone; the power they have to make us feel better, when they’re finally fixed/cleaned/sorted or otherwise taken care of. Sometimes I think I’d take a whole whack of little things checked off the to-do list rather than that one bigger thing! I’m sorry things are hard right now, I hope they get better soon. A house is just a house; a home is the people in it and a soft place to cuddle up with those people. Hugs to you guys. Sometimes you give your home love, and other times, you let your home love you back. This is one of those other times. Let the things you love about your home be part of your support now, whether it’s the color on that wall, or the pillows on the sofa, or the way the light comes through a particular window. Ignore the rest. I hope more peaceful times are yours soon. I’m sorry the craptastic has made its way from the Northeast to the Northwest! Sending you good vibes from this neck of the brightly colored woods. 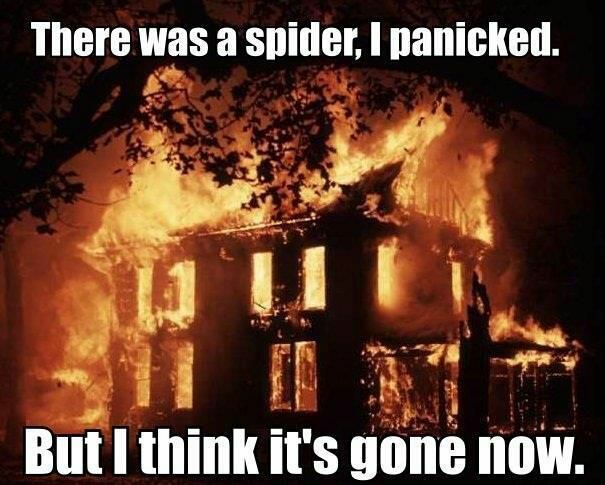 And I’m sorry – if I had seen that critter on my chair, I would have burned it without a second thought. Well, not really, but I would have considered it! Sorry to hear that you are having a tough time. It seems that is going around right now. I know what you mean about the small pleasures, though. I cleaned the bathroom drains the other day (but not as thoroughly as taking apart the pipes, etc.) and I’m happy to have working drains. Yay for showers not ankle deep in cold water! I hope that things improve for you. Hang in there. Small wins for the….win. for sure! We had a slow drain situation like that for forever, too. It’s amazing how long one can put off something that is so easy to fix and has such a big payoff for so little effort. I imagine that someday I’ll feel a similar sense of accomplishment mixed with bewilderment that I didn’t do it earlier whenever I get around to hemming the sunroom curtains that have been dragging on the floor, collecting a disgusting amount of dog fur, ever since we bought them months and months ago. Sigh. Anyway. Sorry things are tough for you right now and hoping they turn around soon! Breaking up a big job into small pieces is what our whole painting-one-wall-at-a-time thing is about. One wall is rarely overwhelming. A whole room can feel so much like too much that we’d never start. I’ve also pretty much given up on getting anything project-like done during the work week. Just getting all of us fed, clothed, and where we need to be takes up most of the energy I’ve got. Oh, Kim. I can’t think of anything more challenging or perspective-giving than making the journey to and through death with someone we love. This: “House projects are now a part of our lives, not the focus of our lives.” Once things are good enough, that’s the way it should be, I think. And I’d really love to see your countertops. We’re all about the plywood around here. Thank you, Heather. Good wishes are always appreciated. Thanks, Alana. Good to hear from you, too. For several years my mom lived away from home during the week and was at home only on the weekends, so I have a little sense of how challenging that kind of schedule can be. I’m guessing that when you only get to be home for two days each week, it helps you really see and focus on what’s important. Even if the weeds get waist-high. You’re right, Sarah. Part of the reason I can let some home stuff go now is because of the work we did earlier. I’m especially glad for the work we’ve done to organize things, so that the day-to-day homemaking isn’t so challenging. And I agree on the chair, and paint, and Pinterest et al. I decided not long after getting the chair that I kinda liked the battered two-tone metal chair base. I would like to cover the seat with a fabric I like better, but knowing how I am it will likely have this cover for a long time! We actually kinda liked all those paintings just stacked up there, which is probably why we didn’t move quickly to put them somewhere else. But I was glad once I did. When we first moved into this house (just a little more than 3 years ago), there were so many things I thought we’d get to right away. We only got a few, big functional things done quickly, and the rest has happened slowly, in small increments. The more I read comments here, the more I think that must be how most of us do it. Thanks, Diane. Although I’m writing about my own personal stuff, I try to do it in a way that it will mean something to someone else’s personal stuff. Appreciate knowing it works that way for you. That’s the best kind of win! Makes me happy to think of you giving your pregnant back a break like that. And weepy is weepy. I remember being pregnant at Thanksgiving, and the thought of going back to school on that Monday made me weepy because it was getting so hard to be on my feet each day. (Only halfway through the pregnancy, but whatever. Still hard.) That Monday was my last day of teaching pregnant, as I started having contractions that wouldn’t stop and got put on bedrest. I think the weepy exists to help us listen to our bodies. Glad you did. You are so right about boundaries. And thank you for the kind words. I just got done telling Alana (on her blog) that I’m envious of you Canadians having Thanksgiving right now. I wish our Thanksgiving were earlier in the fall. I’m glad to hear that you had a nice one–even if it did require some white-knuckle driving. And I’m with you on the whack of little things vs. one big one thing. Gosh, I wish the internets hadn’t eaten my response to your last post. Now I can’t recreate what I wrote–but I really liked your thank you to the hive mind. I was feeling very much like one of the bees all summer. I hadn’t heard of the hive mind concept until I read your post. Explains the phenomenon perfectly. Light through the window has been a comfort lately. Light is always good, as are soft pillows. Thanks for the reminder. OK, true confession: I forgot to clean the critter (or critter case?) before I screwed the seat back on the base. So it’s still there. I’m pretending it isn’t. I figure, I didn’t know about it before and it didn’t bother me! The ankle-deep water made me smile. Because we’ve so had that tub, too! Yes!–Small things that are so easy to fix, but that we put off. Why do we do that? I guess because they are so easy we think we’ll get to right after we do… Although, I would never put hemming curtains in that category. That’s a chore that takes me a while and is no fun at all! When we moved into our house 12 years ago we had a dream list of things we wanted to do. For 12 years our lounge room remained the same blurgh-grey (other than the maroon feature wall that went in the first week ;-)). We didn’t want to paint the room, because the walls were wood veneer and needed replacing, and we didn’t want to replace the walls because we wanted to put a new door in and remove a window, and we couldn’t do that because there was a 6 foot drop and we needed a deck to provide access. It kind of annoyed us (well, me), but it was what it was. Last year we built our deck. YAY! We put in our beautiful double doors and replaced walls. And we finally painted the lounge room. And it is lovely. And I’m so pleased with it. BUT, I don’t think I lost anything in the waiting. My husband is fond of saying, “It’s a home, not a display house.” When we bought the house, I named it “Adullam Azotus”. Adullam is a fortress city from the Bible and Azotus was the cave where David hid from Saul when he was trying to kill him – a place of refuge. The name (for us) means “Fortress of Refuge”. Our home is a place to escape from the madness of ‘out there’; it is a place that activity repeals the mayhem and builds peace. Maintaining that is my focus. There’s a balance – the completed renovations and decorations I want to do might add to the refuge I’m trying to create, but not if the process of undertaking them destroys it. I’ve also found that living with things often helps clarify just what you want and don’t want, what will work or not work. You’ll use those stairs every day for months and one day it’ll just come to you what you need to do to make them work aesthetically. I wanted to renovate our kitchen 18 months ago, but because of finances it’s on hold. A month or two or go, out of nowhere an amazing new layout came to me, which will make the renovation cheaper and the kitchen space amazing. If the kitchen had already been done and dusted, I wouldn’t have been able to retro-fit without huge expense. Some times there’s purpose in the waiting – just to let your brain catch up. Thank you for sharing your experience. I am encouraged to resist the temptation to think I’ve got to “get it right”. I’m writing to share my encouragement with you, in turn. You go, girl! I love that your courage to continue to share your experience reinforces what this 58 year old gal continues to be wowed by – It’s all so freaking beautiful – the pain, the sorrow and the challenges – just like your newly changed light bulb – life continues to be so sweet in spite of every previous darkness. I am going to borrow from Einstein and say, It is all relative! When you are emotionally and physically drained things like the changed bulb and a sink that drains ARE the big things! We all have our ‘seasons’ and sometimes it is the fallow seasons that bring forth the biggest and best ideas (AND energy to complete them!). Loved your two posed questions: Do things work? Are they comfortable? We are a distance from the roughest patch, yet, still in a particular season. For me it has been a practice of contentment (and still trying to figure out and delete clutter). Our home we moved into 20 years ago, just the two of us and two dogs….was plenty of room. Now, there are 2 children – rowdy, energetically fun boys, and a grandfather. We are near wall-to-wall here. So I’m grateful for the small steps of accomplishment in the midst of our diminishing space. My hope is that it be filled with love and not stuff. Now I’m encouraged to tackle the light out in the hallway tomorrow! Welcome! We're Rita and Cane. We've got 3 kids, an old house, a small budget, and big dreams. If you're a life explorer who wonders "why" as much as "how," we're writing for you. Make yourself comfortable and stay awhile. Enter your email address and we'll make sure you don't miss a single one. We get a kick out of sharing. (It's why we blog.) We get an even bigger kick when you share our work, so please feel free Pin us, Like us, or to use an image or two. We just ask that you credit our work and link back to This (sorta) Old Life. (If you'd like to use more than that, please ask first. It's not only what's legal, it's also just good manners.) Thanks!! Kimberly on Is the 70’s split-level the new ranch?